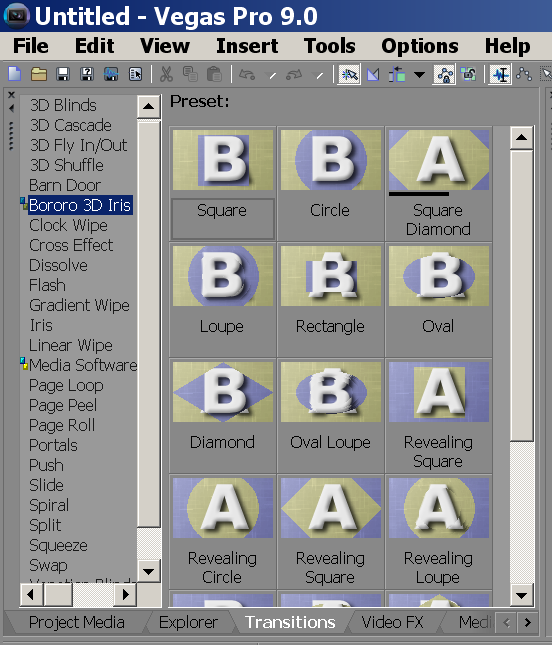 The Bororo 3D plug-in for Sony Vegas comes with several iris type transitions. Unlike the standard iris transitions that are built into Sony Vegas, these transitions were designed for stereoscopic use. They also come with the “lens” feature which will be of interest to both 3D and 2D Sony Vegas users. Additionally, the lens comes in a standard mode and a “convergent” mode. You can use them the same way you use any other transition in Sony Vegas. You place the video you are transiting from on a video track, then place the video you are transiting to on the same track, partly overlapping the first video. For 3D use, you do the same on two tracks, one above the other, one for the left view, the other for the right view, aligning everything as described in the Composite documentation. 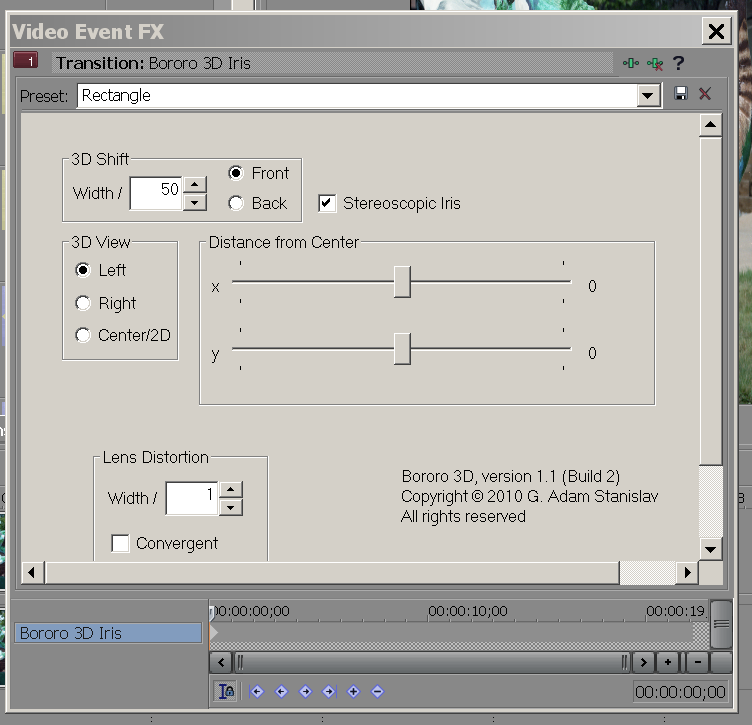 Next, click on Bororo 3D Iris in the Sony Vegas Transitions pane. This will show you a number of Iris presets, as seen in the picture below. All of these presets are based on six basic shapes, a square, a circle, a square diamond, a rectangle, an oval, and a non-square diamond. Each of them can come in its standard variety or as Revealing. The difference is that in the standard variety the video you are transiting to appears very small at the beginning and grows until it covers the video you are transiting from, while in the revealing transition the video you are transiting from starts shrinking and reveals the new video from behind. Two additional presets appear among the presets, a loupe and an oval loupe. These are the lens variety of the circle and the oval respectively. As of version 1.1 of the Bororo 3D plug-in all six shapes come with the lens feature, but in version 1.0 only the circle and the oval did and included the “Loupe” presets. Making a separate preset for each now, especially using both the standard lens and the convergent lens would require thirty-six separate presets, which is unnecessarily too many. Or at least I think it is. At this time, select one of the presets and drag it on the track, the top one of the two tracks if you are working with 3D footage. Sony Vegas is very picky about it: You have to land it at exactly the narrow line where the new video starts. In our example, we will drag the Rectangle preset. A dialog now appears. We will set the 3D Shift at Width / 50, select Front, check Stereoscopic Iris, select Left 3D View, set Lens Distortion to Width / 1, and leave the Convergent box unchecked. Since we are working in 3D in this example, we will drag the same transition to the corresponding place in the lower video track and select all the same options, except we will pick Right 3D View. We are done. All that is left is to composite the two tracks into a 3D video. You can see the result of this example here. The 3D Shift options determine what I call the “threediness” of the transition. They allow you to place the appearing, or disappearing, video stream in front of the background stream. They also allow you to place it behind the background, which is something you normally want to avoid unless you have a good reason not to. I just provide the tools. How you use them is up to you. Two variables control the threediness. 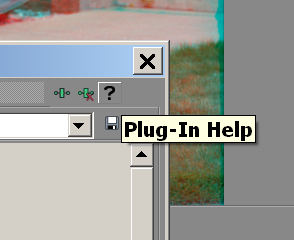 The first is the number in the top left section of the dialog. In the picture above it says Width / 50. Yes, this value is relative to the width of the video frame. Rather than telling it the precise number of pixels to shift one view to the left, the other to the right, you tell it what to divide the width of the image by to determine that number. Why? Because you may be editing a video in 1080p at one time and at 480p at another time. And 4k at yet another time. If you told it the precise number of pixels to shift, the effect would be different each time. But if you divide the width by a number, the effect remains pretty much the same because it will adjust to the changing size of the image. Just remember, 1080p or 480p determine the height of the video, while here we are talking about the width. 1080p is 1920 pixels wide. So, if you choose Width / 100, the left and the right will be shifted 19 pixels relative to each other. And if you choose Width / 1, they will be shifted by 1920 pixels. In that case no visible transition will take place because all the source pixels will be outside the image, so there would be no pixels to use in the transition. So remember, the smaller the number, the more pronounced the threediness. The larger the number, the more subtle the threediness. Play with it. Find the right number that works for you and stick with it. Not rigidly, of course, since different projects may require different threediness. What if you choose zero? Well, division by zero is mathematically undefined. And Bororo 3D is all about mathematics. ≌ If you choose zero, there will simply be no threediness. The transition will be strictly 2D. However, there is a better way to make it 2D (it is described below). The second variable is determined by the two radio buttons to the right of the number we have just talked about. If Front is selected, the changing stream will be placed in front of the background. If Back is selected, it will move behind the background. Almost invariably, Front is the right choice. It also is the default in all the presets. The only time I can think of for the use of Back is if the background is all far away from the viewer and the foreground is all close to him. But that does not mean you cannot think of other times to use it. That is why I made it an option instead of dictating my own way of thinking. The Stereoscopic Iris checkbox lets you choose whether the iris itself is placed in front (or behind) or at the screen. The difference is subtle, so using an image or two may make it clear. After all, as filmmakers we are visually oriented people. The first picture was created with the Stereoscopic Iris checked, the second unchecked. Both of them are stereoscopic. But with the stereoscopic iris, the iris itself is brought in front of the screen. With the other one, the iris is at the screen and we are looking at a stereoscopic picture through that iris. Other than that, the effect of both is the same. Please, study them both with and without red/cyan anaglyph glasses to see the difference. Here you select whether you are working on the Left view or the Right view. You can also select Center/2D. You would do that whenever you are working with a regular 2D video. There is another time when you would opt for the Center/2D view. It is a common practice for 3D movies to also be released in 2D, especially in producing a rental version of a DVD. Companies, such as Netflix, often only rent out 2D movies because they do not want the hassle of including 3D glasses which can easily be lost. Not to mention it is not exactly sanitary to ship the same 3D glasses to different people. When producing the 2D version of a 3D movie you will typically pick either the left or the right video stream and declare it two dimensional. In that case, however, you should go through all of your 3D transitions and make them 2D for that release. As mentioned above, you could set the 3D Shift to zero. That would certainly do it but you would lose the information of what values of 3D Shift you originally assigned to each transition and you would have to figure it all out again if you needed to re-render the 3D version. A much simpler way is to choose the Center/2D view in all the transitions for the 2D render. And if you need to re-render in 3D, just set them all back to left or right depending on which stream you used. Setting the Center/2D view does not remove the 3D shift values from your Sony Vegas file, it only tells Bororo 3D to ignore them. But when you change the view back to left or right, the old values of the 3D shift will still be there and Bororo 3D will use them again. By default, the regular iris transitions will start forming the iris shape in the center of the frame and extend the shape to completely fill the frame as the transition progresses. The revealing transitions do it in reverse, starting with a filled frame and ending with a small shape in the center of the frame. The Distance from Center sliders let you move the small initial (or final in the revealing variety) shape anywhere else within the screen. Just slide the sliders to the left or right to determine where in the frame the small shape should be formed. It will start forming at that position, then gradually move toward the center as the shape grows and fill the frame. And, of course, the revealing variety will do it in reverse. You can add a Lens Distortion to your iris transitions by setting the number in the lower section of the dialog to a value other than zero. Once again, this value is relative to the width of the entire frame. And, again, the lower the number the greater the distortion. And, conversely, the higher the number, the lesser the distortion. The distortion can be divergent, meaning the lens is thicker in the center of the iris than at its edges, or convergent, meaning the lens is thicker at the edges of the iris than at its center. It is divergent if the Convergent checkbox is not checked, and convergent if it is. The video I linked to above shows a divergent lens. To see the convergent version of the same video click here. Unlike in a real-life lens, the distortion in the Bororo 3D Iris plug-in only happens along the horizontal axis with the vertical axis unaffected. This is to emphasize its threediness, which is the whole point of Bororo 3D. You do not have to remember all of this. If you click on the little question mark in the top right end of the dialog, Sony Vegas will automatically load this page straight from the web and show it to you.